It will be like a US presidential inauguration – Carter, the Bushes, Clinton, Obama, hopefully Trump next time – but Danish-style. For the first time in history, state broadcaster DR is assembling the country’s last five elected prime ministers to discuss their time in the hotseat. From opening day blues to being employed in “the world’s most lonely job”, DR promises to present a “strong picture of the cohesion and context which, despite changing governments, characterise Danish democracy”. Earlier this year, Poul Schlüter (1982-93), Poul Nyrup Rasmussen (1993-2001), Anders Fogh Rasmussen (2001-09), Helle Thorning-Schmidt (2011-15) and current PM Lars Løkke Rasmussen (2009-11 & 2015-) gathered at the PM’s official residence Marienborg for two days of frank discussion. 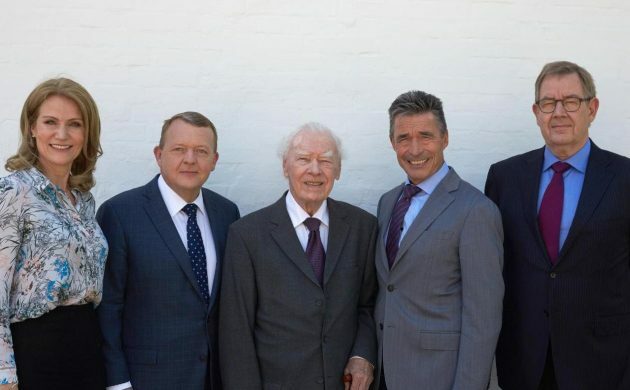 Representing three different parties, the five PMs have led Denmark for the last 35 years. The PM who left office in 1982, Anker Jørgensen, died in 2016. The output will now be broadcast in a four-episode series called ‘Statsministrene’. The first episode is on Sunday August 27 at 20:00 on DR1. Parliament gathers for the unveiling of the picture of Thorning grey (or blonde)?